It represents the entire span of human existence and much, much more. We do not travel through time from some beginning to some supposed end. This is a gross misrepresentation of human existence. Time, in fact, travels through us, and the only reason we know that we are alive is that we are able, in a limited way, to perceive the effects of that passage. Matter, energy, space are all revealed to us by time. 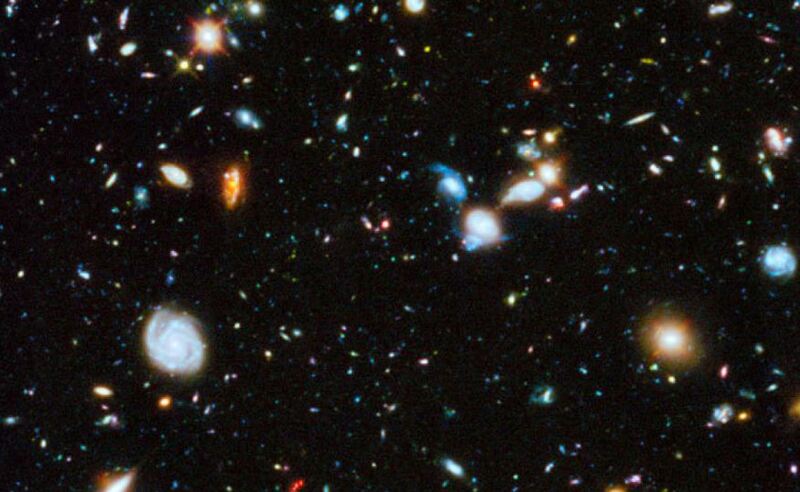 There are thousands of galaxies in this photograph. Galaxies, not stars. Each galaxy contains billions of stars. When this photograph was taken, many of those galaxies actually no longer existed. We photographed a non-existent thing, because we can only perceive the passage of time through our senses, and our senses are quite limited. We know these galaxies are there because we see them. But the light that created the photograph in some cases took millions of years to reach the camera. In some cases it took longer than the human race has existed to cross the universe. In our reality, in the moment, the photograph is a sham. Nothing like this photo exists any longer. But it is the only perception of the universe we have. We talk about saving our planet. We talk about climate change destroying the planet on which we live. We talk that way because we have a very limited view of time. Our perception of time is that it moves slowly. We have lived our entire lives on this planet. Look at that photo again. Tell me what part of it represents your lifetime. Our planet will survive climate change. We, on the other hand, may very well not survive climate change. It’s time to be honest in the way we talk about how we proceed. Words have power to shape minds. We have limited resources. The planet is perfectly capable of renewing its resources. Our lifetime is a blink. We get sick. We heal. Repeat until the cells break down and refuse to do so. The planet will heal so long as we are not on it, dragging it down like an antibiotic resistant virus. It may not be the same planet we know. Many species may be extinct, but that has happened before. We will just be among them this time. That, however, presents a problem for us. We would prefer to exist. The human race has always been driven by two conflicting, driving forces: the desperate need to survive and the perverse propensity to destroy anything that we think stands in the way of our “destiny,” however we define it at any moment in time. Look at the photo again. Where is our “destiny” in that photograph? In the time it would take you to get from the bottom left of that photo to the top right, millions of stars will have formed and died. Where does human destiny fit into that perception of the universe? Look at the photo. Do you see a toaster? Every morning we drop a piece of bread in a toaster and up pops a piece of nicely browned toast. We don’t think much about it. Why do you think you get your nicely browned piece of toast that you don’t have to think about? You get your toast because over the span of hundreds of years humans figured out the principles of mechanics and later electricity. You get toast because of science. If you are going to argue with the basic tenets of science, be ready to argue with your toaster. If you are going to deny the scientific method and scientific knowledge, stick your hand in the toaster and push the lever. Go ahead. We’ll wait. And while you are at it, consider this: you don’t have to know why the toaster works in order to use it. You don’t have to know how it works to see that it does. It works in your house and my house and millions of other houses all over the world. It works. You don’t have to understand physics or electricity or mechanics, because other people – scientists – do. So you can have toast. And cold food. And heat in your home. And a flush toilet. Penicillin. And you can stand there and deny that your toaster exists until smoke comes out your ears. You can refuse to look at it and you can tell your neighbors that toasters are a myth, but every time someone drops in a piece of bread it will still pop up toast every morning. Look at the photo again. Still can’t see the toaster? Close your eyes. Deny that the universe exists. Deny the galaxies and the stars and the speed of light and everything else we now perceive to be the reality. Done? Open your eyes. Still there, isn’t it? Just like your toaster. Just like the system of natural laws that we call science once we discover them. At some point since we first picked up a stone and bashed someone else over the head with it, our “destiny” became complicated. It became our “destiny” to subdue the earth. We’ve even got a book that some cite as permission. It is our destiny to subdue the earth, harvest its riches and its bounty so that we can not only survive but also be comfortable. No more caves – houses. No more fires in the living room – furnaces. No more hunting – vast sheds of animals, bred for food, fattened with care, waiting for slaughter. No more horse and carts – trains, planes, and automobiles. We call it progress, but it is nothing more than an ever increasing desire to be comfortable pursued through science. We have pursued this comfort for so long now that we have lost sight of the fact that we are altering the world itself in the process. Every material comfort we enjoy we have because of science. Science pumps our oil and refines our gas and makes our cars safer. Science makes you well and grows your food and puts you in contact with the world. Science, that thing embodied by a toaster, is what makes everything comfortable. We go from toaster to toaster oven to ceramic range to programmable thermostat to oil refineries to rocket ships to the International Space Station. And they all work. We put men on the moon and rovers on Mars and they work. We build x-ray machines and EEGs and EKGs and MRIs; we rebuild people’s hips and replace their hearts. It is all science and it all works. But science doesn’t make ethical decisions. We use the science we discover and develop. It is neither good nor bad. We can use it for good or we can use it to destroy ourselves. To borrow a phrase, the universe will little note nor long remember what we do here. Look at the photo again. Which galaxy is the good one? Which one represents the dark side? Science doesn’t decide how you use it. Ask your toaster what you should do today. The concept of our comfort has become inextricably intertwined with big business. Big pharma, big Agra, big oil, Silicon Valley. They use science to create the goods that keep us comfortable. Sometimes they are the ones that discover and develop that science as well. For them, science is income. That’s their idea of comfort. Profit. It is also how they survive. Profit. For them, profit magically embodies both of man’s conflicting driving forces. Profit makes big business comfortable and allows big business to survive. It allows us to be comfortable as well, but it need not define our survival. At one time our worst fear was that we would destroy ourselves with our nuclear weapons, a product of our science. We even have a “doomsday clock” maintained by The Bulletin of the Atomic Scientists. They have set it for three minutes until midnight, so there is still a good chance we will blow ourselves up. A nuclear accident or a nuclear war has the potential to do irreparable harm to the planet itself as well as wiping out most living things. That would be a one-time event, however. The warming of earth’s atmosphere is not a one-time event. It has been happening for many years, and unless it is stopped, it will result, first, in an economic catastrophe around the world and then in an extinction event of epic proportions. How do I know this? Science. The same science that allows me to be confident that when I push the lever, toast pops up. The same science that put men on the moon and rovers on Mars. The same science that can predict how close a meteor will come to earth while it is still so far out in space that it is undetectable to our naked senses. I know this because when I push the button on a gizmo in my pocket, my car starts in the driveway, and not now and then: every time. I know this because every time I turn on my computer and bring up the right software, I can see and talk to friends across the ocean. Science works. It works every day, all over the world, and NO ONE DENIES THAT. Go ahead. Stick your hand in the toaster and push the lever. THERE ARE NO SCIENCE DENIERS. There are selective science believers. They come in two varieties. One variety simply doesn’t understand what science is and how it works, and, mostly, they don’t care. So long as the toast pops up, it’s all good. If the toast doesn’t pop up they pay attention long enough to buy a new toaster. Until they can see it, touch it, smell it, drown in it, they aren’t interested in it. They aren’t stupid. They aren’t necessarily uneducated (as education goes in America today). They just have a very narrow sphere of awareness. Millions of people still think the sun goes around the earth, and since it rises every morning and sets every evening, what difference does it make which one is at the center? The other variety has a personal stake in believing in some science and not in other science. For some that stake is religious. Their religion insists they believe things that are in conflict with what science tells them. Geology must be wrong and carbon dating must be flawed because they know the age of the earth and it isn’t millions of years. Evolution isn’t possible. These ideological decisions to embrace the science that saves lives through medical advances and reject science that conflicts with religious belief may be troubling to some, but it is understandable. For the rest, the personal stake is all about destiny, both manifest and personal. It is about comfort. It is about profit. And this is much less understandable. The climate is warming. That is now established science. It is just as established as the science behind the flow of electrons in a wire that makes your toast. You can find people out there that say it is not established science, but they are outliers. You can find whole groups of people out there that maintain that the earth is flat too. Humans have contributed to the warming of the climate. This now established science. Climate warming is only a problem if you see it within the context of our ability to alter it. If we cannot alter it, then it is not a problem. We will be a part of an extinction event on a large scale. This does not mean all of our species will die out, although all of many species may. It almost certainly means an enormous reduction in the size of the human population. That alone is a self-correcting event from a planetary perspective, in planetary time. From the perspective of the planet itself, it is almost certainly the best option. From the perspective of the human population, it’s not so good. The first variety of selective science believers who reject climate warming will come around quickly when Miami starts evacuating coastal residents, water is up to their ankles, and they can’t get Florida orange juice. The second variety may very well not come around. Our ability to alter the warming process relies on our ability to restrict the burning of fossil fuels and reducing the carbon we release into the atmosphere. Corporate empires will fall in that effort. Profits are being threatened by that effort. The comfort of a great many people with a good deal of power is threatened by that effort. They would have the whole human race go to hell before they lose their power. They think they will make a profit out of this mess somehow. When Miami is underwater, those people will have to relocate. There are cities to build, more oil to burn, more profit to be made from rejecting the idea of a warming atmosphere than eliminating the causes. The danger we face isn’t science deniers. There are no science deniers. The danger we face is people in power who make unethical decisions for personal and corporate profit motives about what science is OK to accept and what science must be ignored or rejected. These are not stupid people. These are not uneducated people. Don’t make excuses for them. These are unethical people who put their comfort above yours and their comfort and profit above the survival of the species. There is a place for such people in our society, just as there is a place for people who carry signs on street corners that proclaim the end of the world three days from now, just as there is a place for the flat-earthers. That place is not in our government. It is not in our White House, our Senate committees, or our EPA. Trump’s selection of Myron Ebell, a man with past connections to ExxonMobile, the American Petroleum Institute, Dow Chemical, Eli Lilly, and others, and a prominent climate warming rejector as the transition team head for the EPA is another step toward global chaos. If we have any chance of altering the warming process, the single most important element is time, and unethical corporate lackeys like Myron Ebell and his cronies are wasting it purposely. Look at the photo one last time. The same people who made toasters possible made that photo possible. Politicians did not make it possible. Oil companies did not make it possible. Neither did think-tanks or the Heritage Foundation or the Competitive Enterprise Institute or the Koch brother’s billions. Neither did a general population that couldn’t cobble together something as simple as a waffle iron if their life depended on it. Our lives depend on this. We have to decide to trust the toaster guys. And we have to decide very, very soon. This entry was posted in The Curmudgeon's Lair and tagged climate warming, EPA, Myron Ebell, politics of science, science by Roger A. Shipley, The Willowbrook Curmudgeon. Bookmark the permalink. Roger, when I read this, I kept thinking you were plagiarizing me. It’s just that your voice is so similar to mine. You keep saying things that I have said and certainly might have said. Why do we have such strong concerns about our species quest to know? I think it comes down to what we are. I think what we are individual cells in the body we call humanity. We get most of our meaning from the whole of humanity but our individuality is living our roles as individual workers in accordance with our smaller cellular contribution. It has been a privilege here in my last years/days to continue to know new friends here on the internet much as I used to by reading their work and occasional letters. Keep up the work, it is FUN!